Well, it's official. I'm a minivan-driving soccer mom. I guess we knew this day would come eventually, right? :) Abby decided she wants to play soccer this year, so she is on a team of 4- and 5-year-old girls with the Searcy leagues. Today was her first game, and it was a lot of fun! 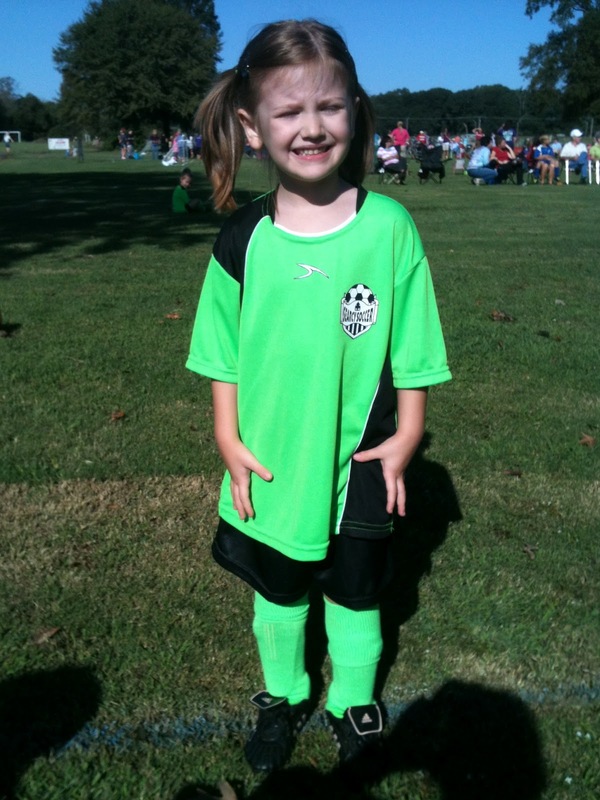 She was very excited to wear her uniform and use her new soccer ball (which just happens to match her uniform perfectly), and she got right out there and played like she had been doing it her whole life. Today was the first time the team was together, so it was an interesting experience. They practice for the first 30 minutes of the scheduled time, and then the game against the other team is the last 30 minutes. It was quite clear from the beginning that the other team had a few veteran players on it, and I'm pretty sure our girls had barely seen a soccer ball before, much less kicked one into a goal. Abby caught on very quickly during practice, and she was the first (and only ;)) one on our team to kick a goal during the game!! I was amazed at how well she did for her first game. Casey referred to her as "the aggressor" of the team. ;) One of the girls spent half of the game crying, and we had another one who mostly walked around with her thumb in her mouth. 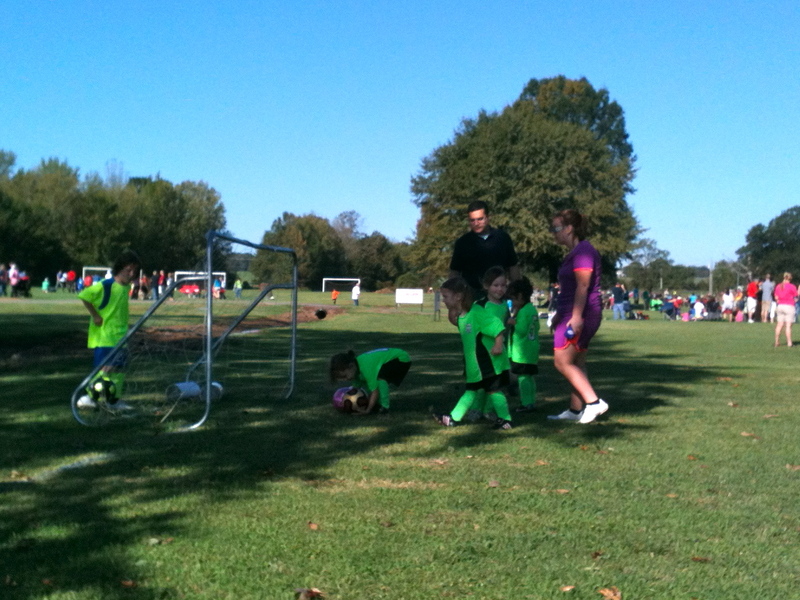 Basically, it was what I expected a soccer game with preschoolers to look like. Abby did get a little bit discouraged that the other team kept getting goals--she does not like to lose at anything! But it was a good time for us to reinforce those important life lessons like, "you just do your best," "it's ok if you don't win all the time," and "you still need to have a good attitude." I am hopeful that she will be able to handle this a little better as the season goes on because I'm pretty sure our team is the only one that has ALL new players on it. It will be an interesting few months... :) Abby Liz, you did an amazing job out there today, and we are so proud of you!! !